Al Reef for Investment and Agricultural Marketing Company is a private shareholder limited company. It is owned by the Agricultural Development Association previously called Palestinian Agricultural Relief Committee (PARC) and was established in 1993 in an attempt to provide promotional, marketing, and manufacturing services for Palestinian agricultural products. The company exports its products to numerous organizations in Europe, USA, Canada, Japan, New Zealand and U.A.E, in addition to the local market. 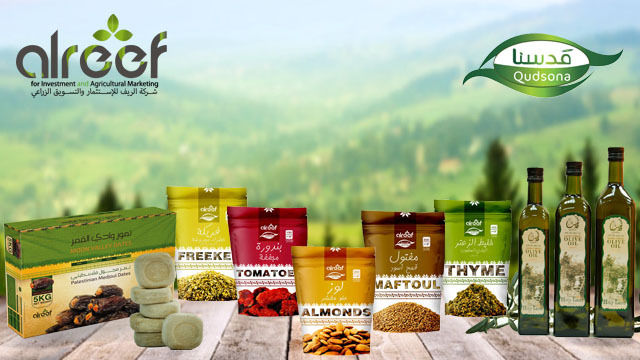 Al Reef Company has a developmental vision based on creating sustainable development in the Palestinian rural areas, and it produces, promotes and markets all kinds of olive oil (virgin, extra virgin, organic and organic extra virgin), medjoul dates, almonds, couscous (Maftoul), dried tomatoes, thyme (Za'tar), olive paste, date paste, roasted green wheat (freekeh) and olive oil soap. Al Reef Company adopted the principle of fair trade in collaboration with PARC. Accordingly, it aims at organizing the efforts of agricultural cooperatives for farmers and women to improve their social and economic situation through developing their production capacity and improving the quality of their products. The overall objective is that farmers and women will obtain fair prices for their products; the prices which ensure a decent life for them. Fair trade operates throughout an integrated development vision seeking the achievement of sustainable development for the marginalized groups from Palestinian farmers and women in rural areas. With the participation of farmers themselves and in cooperation with the Palestinian Farmers Union ( PFU ), (FTD) determines the needs of the farmers and helps plans for future activities. The company has different quality certificates including organic certificate for EU, BIO-Suisse and NOP. During 24 years of work, Al Reef has been able to establish solid partnerships based on transparency with numerous Fair Trade Organizations and Solidarity movements in Europe, USA, Canada and Japan.